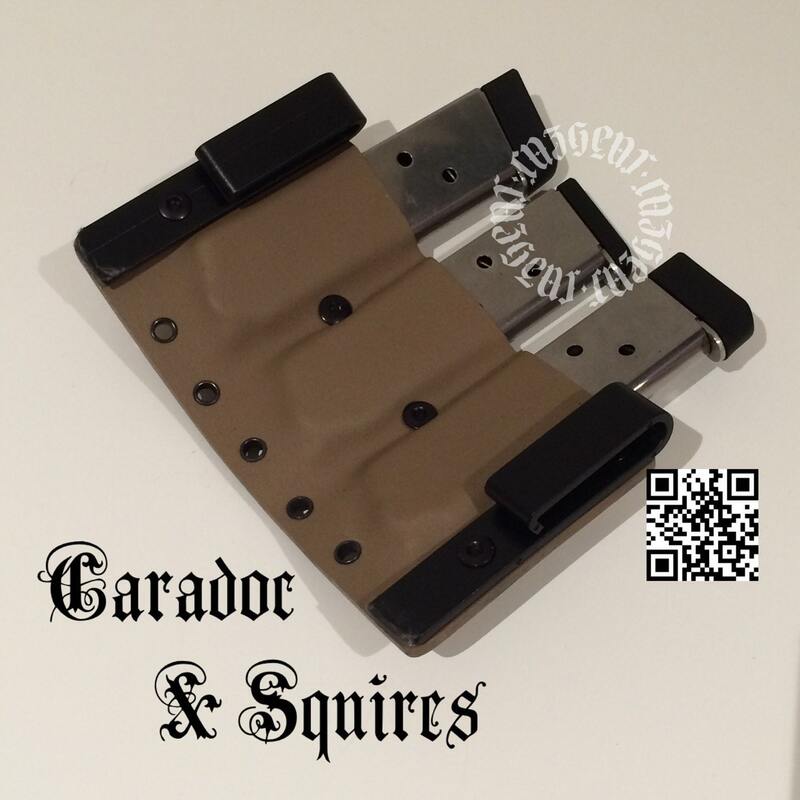 Caradoc and Squires Triple Mag Pouch. Fits outside the waistband or combat vest carry. Production Disclaimer: The majority of the products developed by CazGear are produced by hand and are not a result of the use of high tech precision machinery. In order to meet your satisfaction, we work to communicate with you throughout the production process to avoid any misunderstandings when manufacturing your product. To send promotional offers if you sign up and request it. Your information will never be shared with anyone outside of CazGear! We promise! What is your average turn around time for holsters? Average turn around time from payment to shipment is approximately 5 to 7 days on average. Can I pay for rush processing? Yes, for a small fee, we can expedite your order within 24 hours or less. Simply email cazgear@cazgear.com for more details. 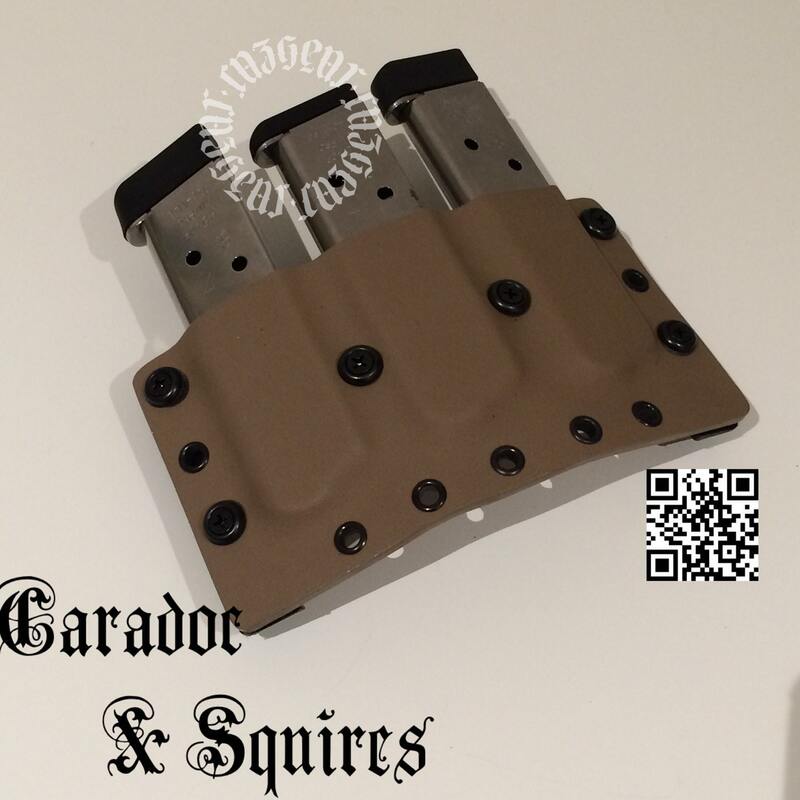 Why don't you offer taco style (wrap around) holsters? We do! However, they are not as popular and we respond to customer demand. 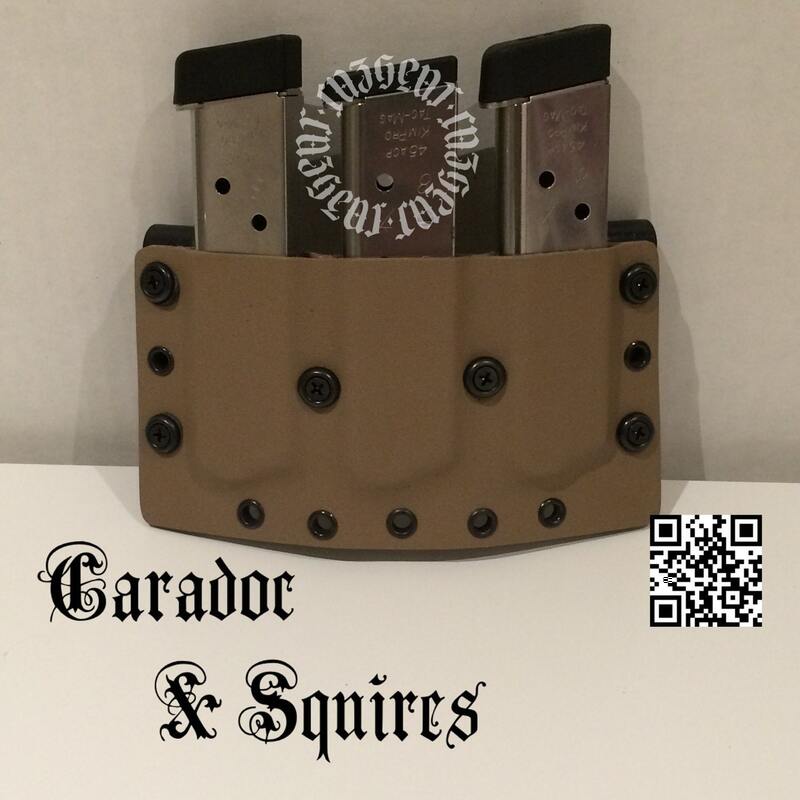 Simply send us a custom order request and we can make the holster of your choice. Can you make an Inside the Waistband with a light at a 30 degree forward cant? We strongly recommend guns with light attachments be made at no more than a 15 degree cant as more material is used and elongates the holster considerably. If you choose to have a light on your gun, please know it may not feel as comfortable as a gun without a light especially when wearing inside the waistband. If I have a problem with my holster, what can you do to resolve my concern? Simply contact us on Etsy or email us at cazgear@gmail.com, or call 323-739-5333 and we will address your concern immediately. Customer service is our highest priority and we will either replace or rebuild your holster upon return of the holster. Please understand that we make mistakes and we will rectify it as soon as possible. My Organization/Agency/Police Department would like to Test & Evaluate your gear before we purchase. Can you send us kits to test? Unfortunately we are a small service disabled business and can't afford to send gear for test and evaluation purposes for free. Simply custom order the kit you require through us and we will send an invoice for payment. After payment, we will produce and ship your gear. I have to say that i had been looking online for this style of mag pouch for some time when i stumbled upon Caradoc. This is probably the highest quality pouch that is available on the market right now! You definitely get what you pay for here! The quality of materials, fit and finish are perfect! Right out of the package it was perfectly adjusted to fit my G19 mags, haven't had a need to tighten or loosen those adjustment screws! Additionally i was able to reverse the clips to make this an IWB mag pouch. Its bit bulky but with the right belt it works. I will be making several more purchases from this seller in the future. Reliable quality products are exactly what you need when you are serious enough to carry a triple mag set up.